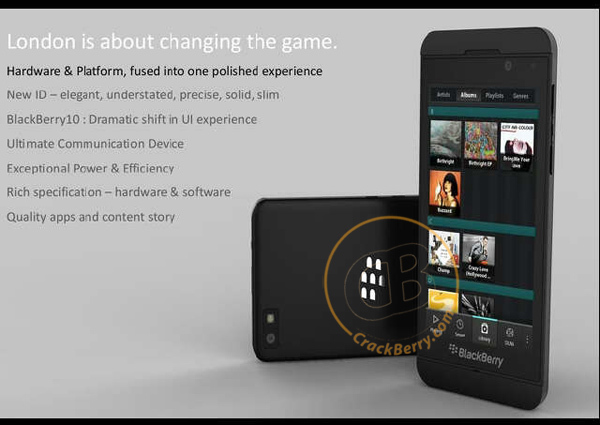 This is a picture that is hopefully what we are going to see with the first BlackBerry 10 device, though it may not be the first to be released it is the first look at what we might see coming from RIM in 2012. Although it looks different from that of the first leaked images of the BB10 ‘London’ I really like the look of this device and I know a lot of people will be attracted to this form factor and the supposed specs this device might have, like a 1.5Ghz dual core processor, according to CrackBerry possibly TI OMAP5 and Qualcomm chipsets are being tested. Hopefully this is a device that we will see before too long and this is a device I believe is going to really boost the future of BlackBerry in the mobile market and will attract a lot of old and new consumers back to BlackBerry.